Grey Gardens is a modern property with a mix of new and old, designed to fit into the landscape and its surrounding heritage areas, The property is furnished with a eclectic mix of retro furniture, industrial antiques, salvaged pieces and plush textiles, to give a warm homely nostalgic feel. 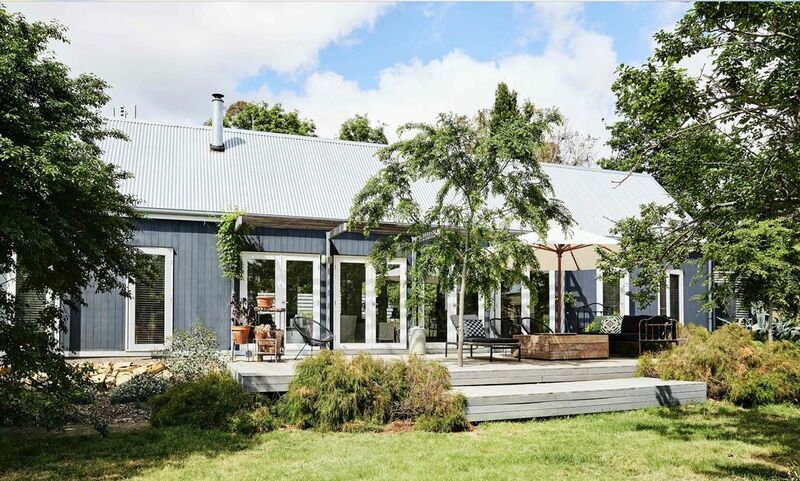 Located in the historic Wattle Gully, Grey Gardens looks out over the old goldfields and the national heritage park, set in a quiet picturesque part of Chewton surrounded by national parks and walking tracks. Relax locally in Chewton or head into Castlemaine and explore the many antique stores, cafe's & a vibrant arts scene. A short drive will take you to the Wesley Hill Market on every Saturday, with a great selection of local produce, crafts & plants & bric-a-brac. Packed with things to do Chewton and Castlemaine is the perfect spot for a weekend getaway. Grey Gardens sleeps up to 4 adults and is a couple’s retreat, so leave the kids at home, kick back, relax & enjoy the peace and quiet. Grey gardens has two large equal sized bedrooms both with generous ensuite bathrooms and queen size beds so you won't have to flip a coin on which bedroom to choose from. Linen, towels and robes are provided for your stay, and with views from the bedroom out into the garden you can lie in bed under the covers and enjoy the views on those frosty mornings. Each bedroom has a private ensuite bathroom with a generous sized shower, toilet and an antique cast iron basin. Bedroom One also has an original 50's mint green cast iron bath with views out over Wattle Gully. Take the time to run a bath and enjoy it over a glass of wine. A large open plan living space with 16foot vaulted ceiling gives you a sense of space and with eight sets of French doors out onto the decked areas on both sides of the house the garden is never too far away. Kick back in the huge linen sofa in front of the wood heater, listen to some vinyl on the vintage record player or sit and enjoy the views out into the garden and out over the goldfields. A fully-equipped open plan kitchen with a huge work bench-come-dining table allows you to cook, eat and enjoy each other's company while preparing meals and with all the kitchen utensils, appliances along with all the pantry staples you will possibly need for a country cook up. The property has two huge decked areas on either side of the house, relax in the sun on the north side of the house in winter or escape the heat on the south deck in summer. Furnished with a selection of 50's garden furniture, a Barbeque and outdoor settings all perfect for al fresco dining. A cozy study alcove offers a quiet place to sit and work, you will find a collection of brochures on the local area to help with your stay, it's the perfect spot to plan out what to see and do on your stay. Thank you Claire So pleased you enjoyed all that we offer here at Grey Gardens, we hope to have you back again sometime in the future. We thoroughly enjoyed our stay at Grey Gardens. It had everything we needed. Cooking utensils, pots and pans, glassware, crockery and cutlery and general grocery items were provided. The herb and vege gardens were able to provide us with some extra salad goodies. Watching the kangaroos bound through the property at dusk was quite amazing. We will definitely be back. Thanks Dianne We are really glad you enjoyed your stay with us at Grey Gardens, very much hope to see you again sometime. Grey Gardens is a beautifully presented and ideal getaway, at any time of year. It has something for everyone regardless of age and interest, including the best tree swing for kids. The historic area is equally delightful offering local produce, antiques and great walks. We spent a relaxing weekend at Grey Gardens with another couple. It had everything needed to make you feel at home. We loved sitting by the fire listening to some old jazz records and having breakfast out on the veranda. The neighbourhood is lovely and quiet and Castlemaine is just a few minutes away by car. We will be back! Lovely house with all the mod cons, in a quiet area but close to Castlemaine. Nothing better than relaxing in front of the wood heater and watching kangaroos and rabbits in the adjacent paddock. Highly recommended. This is a really great property and we had a very relaxing time. We stayed 3 days here with another couple. I liked the fact that each bedroom had its own bathroom. The decor is lovely and the couch and chairs really comfortable. We enjoyed playing the old records. The kitchen is well equipped and spacious. And it is in a very quiet location but still close to the action of Castlemaine and surrounds. Recommended.